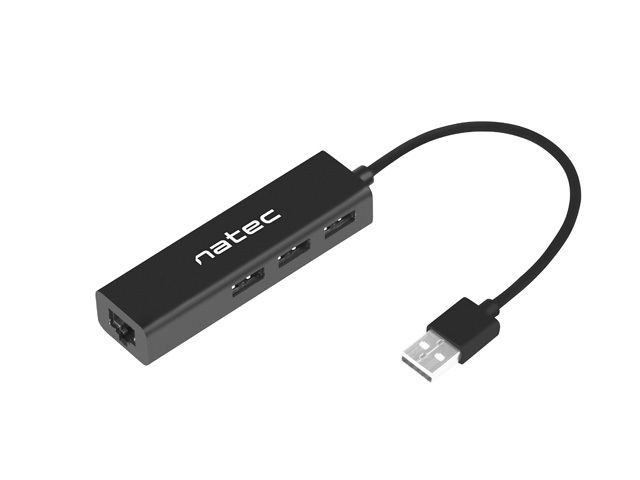 HUB USB NATEC Dragonfly is the perfect way to increase the number of USB ports available in laptops and PCs, giving the user more convenience and freedom. New models of laptops and ultra-books now usually come without an Ethernet socket (RJ-45) to connect directly to a network via a cable. Whenever the available wi-fi has insufficient bandwidth and the user requires an efficient and fast network, Natec Dragonfly can help connect quickly to the network by means of an RJ45 cable. The device is so practical also due to its small size. HUB Dragonfly can fit literally everywhere: a backpack, a bag or even a trouser pocket. Its universal design is a great match for every office space.